I am excited to share with you that I have enlisted some extra help. In order to bring more tutorials, more often I have invited several bloggers to be contributors. First we have Sonja from Craft-werk. I love Sonja’s style and her recycleminded crafting. Make sure to check out her blog. I am still on the lookout for 4 more monthly guest contributors, if you think you would like to be a part, email me with 5-6 links to your best tutorials or design advice posts. And I will check them out and get back to you as soon as I can. 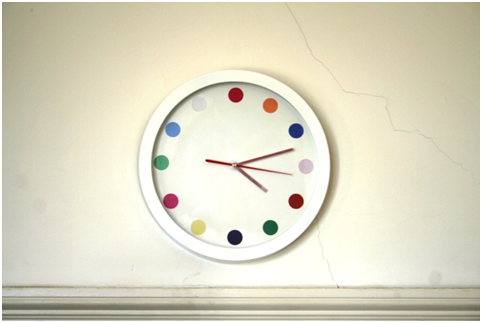 A good while back I was given a simple wall clock by a friend who used to work in a health food shop. The clock was a promotional item that the shop had been given. It was rather non-descript – and marred by the company logos on the clock face. My first solution was just to paint black marker over the logos and keep the clock otherwise unchanged. It graced my kitchen wall for a year or two. 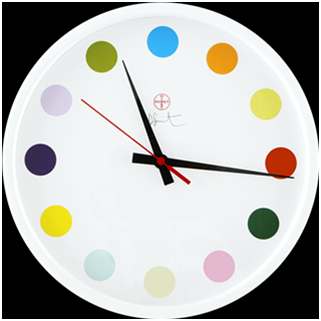 And then I came across the Damien Hirst Spot Clock in my favourite interior design magazine, Living etc. Can you believe that they charge 285 English Pounds/460 Dollars for this beautiful but simple design? Hang on, I can create that for less! 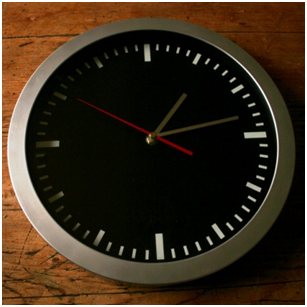 My kitchen clock has the same simple surround – and is cheap enough to be tampered with. 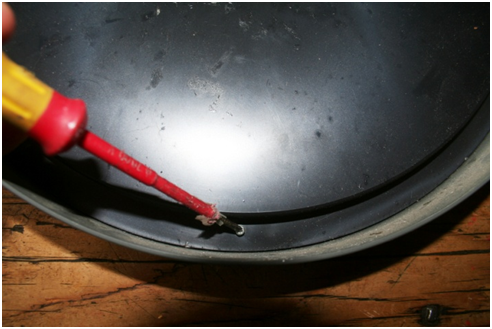 So out came the spray paint and the circle punch. Dissemble the clock, take out the glass and the clock face. 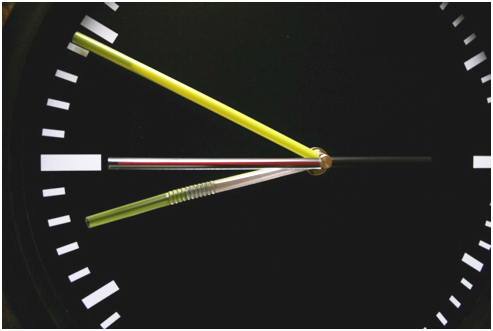 Protect the clock hands with straws – unless you can dissemble the clockwork. 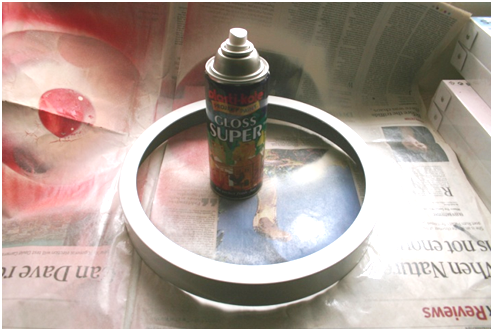 Spray the clock frame and the clock face with white gloss. 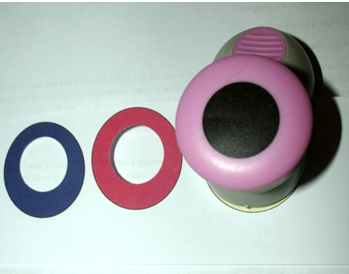 Print out 12 colours of your choice on a piece of paper and punch out circles with a circle punch. Stick them evenly on the clock face with spray adhesive. Make sure you mark the top of the clock where the hanger sits. 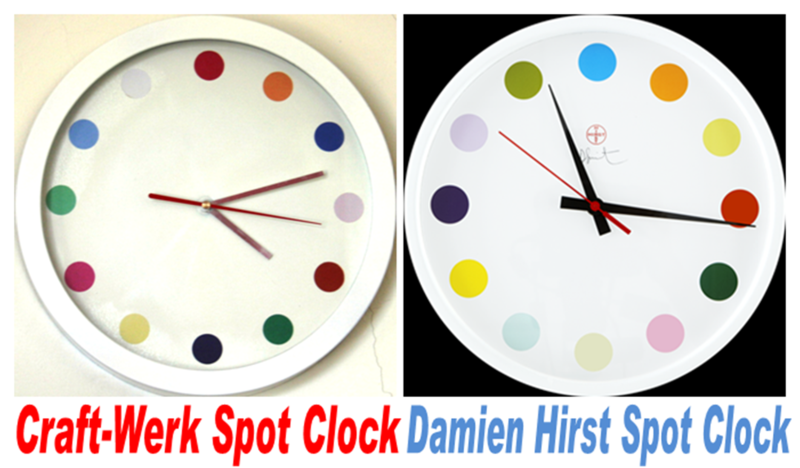 Re-assemble all components and hang your new Damien Hirst Spot Clock rip-off. Thanks Sonja for the awesome project! to your best tutorials or design advice. >Beatiful transformation! It looks every bit as good as the expensive clock. Great job! >This looks great! You are so creativ! >Oh this is very cute!! And its cuter because you did it! >WOW! This is super cute!! >Almost missed the post. Thanks for showing this, Cassity! >This rocks! Love it, thanks for sharing. >That clock is "spot on"…(sorry had to be said). >That is so awesome!!! My girls will love this one! !